I have no idea what your mechanic did. But a W126 tumbler is a W126 tumbler, so if unless he put something strange in you should be able to either replace it with a vin cut one, or get it out. I don't really understand how the w126 ignition lock and parts that go with it work, but I did have to pay for all of it once. I thought just by getting a new ignition cylinder with keys, which I didn't get from MB, would fix the problem when my original key stopped turning the original ignition. I couldn't get the tumbler out so I had it towed to the nearest foreign repair place around. Anyways, they used the aftermarket cylinder and supposedly ordered a MB $350.00 lock. My question is can I destroy the ignition, and have a key made with just the lock? I hope so, because my mech. supposed to be in the process of having the ignition drilled (destroyed). Thank You for ALL replys and comments! At his cost I hope, including the replacement. You can buy an aftermarket tumbler for $35 of Fastlane. $800 bill sounds like they replaced the whole thing to the steering colum, must have been a dealer sounds like something they would do. As long as nothing is broken, you should never need to replace anything more than the tumbler. Aftermarket are $35, vin cut from the dealer are $100. I paid under 100 dollars for a new Tumbler with key with my insurance card. That guy shouldn't be retired, he should be jailed. The damage to the wood and dash parts are already over the $1000 mark, plus what is he doing? Going to grind until he gets to the bottom of the tumbler? Then what? It would have been easier to remove the steering column. Find another mechanic..........immediately. This moron is clueless. What could he be possibly doing here??? He has turned into a hunter instead of a mechanic. Hunting for a way out of the deep ca-ca he is in now. Whiz Wheel or an Air Powered Dremel? Two Words, and the second one is UP! damage to your dash than they've done. You Best (as you've been advised here)get that W126 out of those fools hands! You're rapidly approaching the the Small Claims Court dollar limits in whatever U.S. jurisdiction you live in. for delivery to a real shop or(I hate to say it) the Stealer in the Morning. I would expect to have to sue to be made whole,Unfortunately! Run away, and send him the bill, including for the tow truck! Those words should hit home. Take pictures, document everything, you're in it deep but he might be slippery. Wow I thought he was clueless at the beginning of this thread, but this just confirms it. I would bring it somewhere else ASAP, get an estimate to properly fix it including the wood and dash; than present him the bill. If he balks I would take him to small claims court. If this was my car he would be served for small claims before the end of the week. 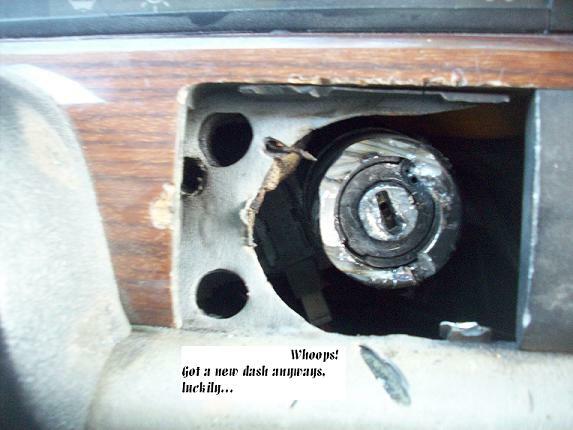 Insted of hacking the living **** out of your dash why the **** didn't he just order a vin cut key from the dealer for $20 to see if it works? Its worth a try its cheap and quick. If its an aftermarket tumbler I would have called a locksmith. But considering what he raped you for it better ****ing be an entire OE ignition. Once you have a key that works, you can turn the tumbler to position 2, stick a paper clip in that little hole to release the collar, and unscrew the collar. Their is no MB tool to save you their, you need to get the tumbler turned to position 2, or yank out the whole wheel and column and replace the ignition, $$$$. Which would probably cost $800+, and if he did that before,(because he is dumb and doesn't know anything about these cars) I don't know where his brain went but thats what needs to happen again. I'd be very angry if I were you. As you can tell from my post. Last edited by Hatterasguy; 03-27-2008 at 10:28 PM.